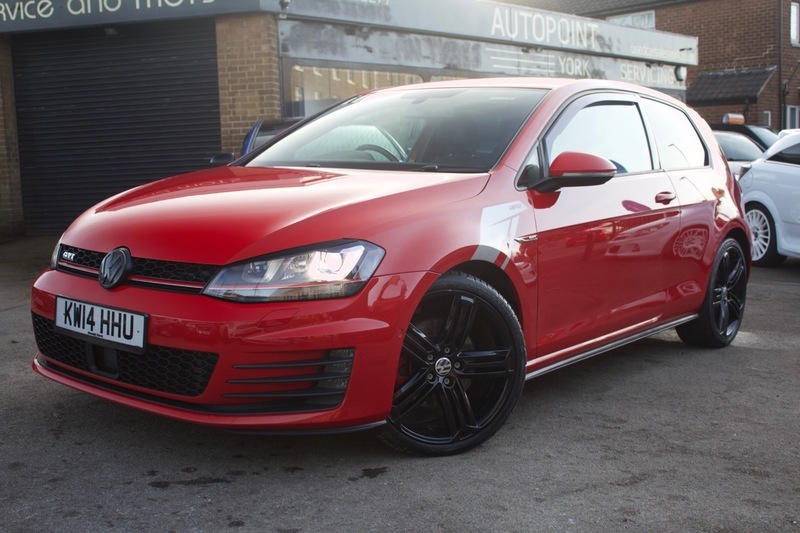 Here we have our Golf GTI finished in Red and desirable Tartan interior. Just in so more pictures will follow but we expect the car to sell very quickly at this asking price. The Golf has a Remus Exhaust and has a Stage 1 APR Remap which APR have confirmed the car is running around 310-330bhp. The Golf also comes with ABS, Air Conditioning, Daytime Running Lights, Xenon Headlights, Alloy Wheels, Climate Control, Sat Nav Touchscreen Multimedia System, Bluetooth Connectivity, Carbon Fibre Interior, Electric Windows, CD Multichanger, Parking Sensors, Lumbar Support, Audio Remote, Headlight Washers, Alarm, Sports Seats, Front Fog Lights, Heated Mirrors and ISOFix. The car also comes with MOT, 12 months Service, Warranty, Free AA Cover for a year and Pre Delivery Inspection Report.